Figure 24: Inertial and non-inertial reference frames. 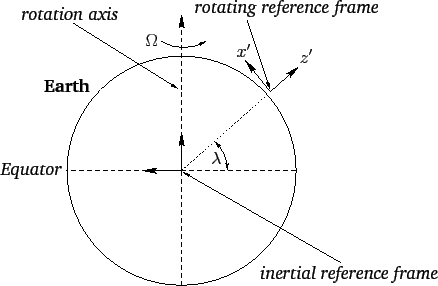 where is the displacement vector of the origin of the rotating frame (which lies on the Earth's surface) with respect to the center of the Earth. Here, we are assuming that our object is situated relatively close to the Earth's surface (i.e., ). It can be seen, from Equation (417), that the apparent gravitational acceleration of a stationary object close to the Earth's surface has two components. First, the true gravitational acceleration, , of magnitude , which always points directly toward the center of the Earth. Second, the so-called centrifugal acceleration, . This acceleration is normal to the Earth's axis of rotation, and always points directly away from this axis. 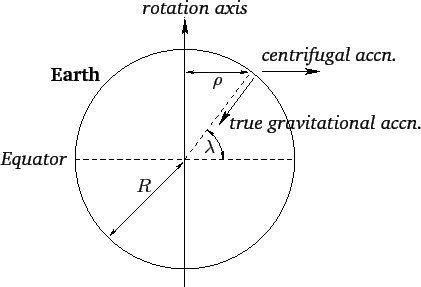 The magnitude of the centrifugal acceleration is , where is the perpendicular distance to the Earth's rotation axis, and is the Earth's radius--see Figure 25. According to the above equation, the centrifugal acceleration causes the magnitude of the apparent gravitational acceleration on the Earth's surface to vary by about , being largest at the poles, and smallest at the equator. This variation in apparent gravitational acceleration, due (ultimately) to the Earth's rotation, causes the Earth itself to bulge slightly at the equator (see Section 12.6), which has the effect of further intensifying the variation, since a point on the surface of the Earth at the equator is slightly further away from the Earth's center than a similar point at one of the poles (and, hence, the true gravitational acceleration is slightly weaker in the former case). Here, a positive angle denotes a northward deflection, and vice versa. Thus, the deflection is southward in the northern hemisphere (i.e., ) and northward in the southern hemisphere (i.e., ). The deflection is zero at the poles and at the equator, and reaches its maximum magnitude (which is very small) at middle latitudes.